President Julius Maada Bio has visited the diamond-rich district of Kono, eastern Sierra Leone, as part of his nationwide thank-you-tour and assured a mammoth welcoming crowd of the possibility of a state-of-the-art science university in Koidu City.In his welcome address, the Honourable Paramount Chief Member of Parliament, Sahr Yongai Kontanday Mbriwa of Fiama Chiefdom, said it was an honour to receive the President and his entourage in Kono for the first time since the new government in April last year.He confirmed that President Bio’s visit was historic because it also marked the grand home-coming ceremony of Vice President Dr Mohamed Juldeh Jalloh and the country’s First Lady, Fatima Bio, both of them said to have been born and raised in the cosmopolitan diamond mining and cash crop producing district.”We the people of Kono are extremely happy to receive you, sir. This shows how much value you have attached to us as a people. We also want to thank you for the government appointees from Kono and for the introduction of the Free Quality Education, but most importantly, we thank you for your dream of providing a university for the people of Kono. We shall forever remain grateful to your government and the Sierra Leone Peoples’ Party at large,” he said.Mayor of Koidu City, Komba Mathew Sam, said they were happy to have the president to the district of precious minerals and expressed hope at the prospect of them benefitting from the New Direction Government’s effort at prioritising education.”We appreciate your government, Mr President, for the Free Quality Education that you have introduced. This is the first time after almost a decade that 17 schools in Kono have been approved and have received their packages of the Free Quality Education,” he disclosed.Mayor Sam thanked the government for its sustained plans and steps in the fight against corruption in the country and pledged their support the government in the pursuit of political accountability. He said fighting and ending corruption was the only way to assure the country of lasting development.He thanked the President for his thought of giving Kono district their own university and announced that the Koidu City administration had already provided 17 acres of land for the construction of the said university. He, however, encouraged President Bio to continue his support for Kono so that they too could develop as other cities in the country had been. The Vice President, Dr Juldeh Jalloh, said that President Bio was the promised saviour, meant to transform the country with honesty and sincerity. He introduced the President as the godfather of the Free Quality Education and a man who had pledged to increase the human capital investment through education to a level never attained in the country. 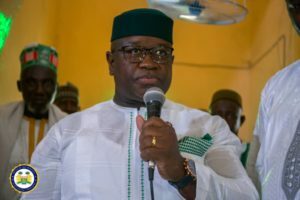 In his response, His Excellency President Julius Maada Bio said in amazement that he was happy with the turnout of people who had left their many busy schedules to welcome him to Kono, where he had gone to thank them for overwhelmingly voting him as President in the 2018 elections. He told them that he had prepared for several years to govern Sierra Leone with righteousness so that he would usher in lasting development. “My victory as a president is as a result of the collective support of everybody, including that of Kono. I have long prepared for this leadership and I will not be failing you. I will use every energy in me to ensure that Sierra Leone is transformed into a place that everybody will be proud of. Diamond and gold will vanish, the only thing that is sure to transform this country is human capital development. This is the reason I have placed 21% of the country’s annual budget to support education. This, I think, is the best offer every right-thinking Sierra Leonean should embrace with all sobriety,” he assured. President Bio added that the Commissions of Inquiry were a genuine fight against alleged thieves and that emphasised that it would not target any sect or tribe or region, but would investigate wicked people who had robbed the country of her resources. “Anyone who stands in the progress of the Commissions of Inquiry will receive the stiffest resistance from me. There was no enough reason why the country suffered from the civil war, but if fighting is the last resort for the Commissions of Inquiry to progress and stop corruption in the country, then it is a rightful fight that we must do to ensure we eradicate thieving and embezzlement from politics,” he assured.